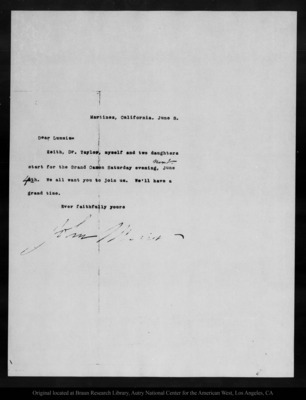 Letter from John Muir to [Charles F.] Lummis, [1913?] Jun 3. Braun Research Library, Autry National Center for the American West, Los Angeles, CA. ID Numbers: MS.1.1.3221A Charles F. Lummis/Mr. John Muir Correspondence 1895-1905; and MS.1.1.3221B Charles F. Lummis/Mr. John Muir Correspondence 1906-1913. Please contact this institution directly to obtain copies of the images or permission to publish or use them beyond educational purposes.